Speaking of Research try to keep on top of the latest statistics coming from governments around the world. This post will look at three countries which have recently published their 2016 statistics. All three are regulated by EU Directive 2010/63 which requires countries to produce national statistics on their animal use. 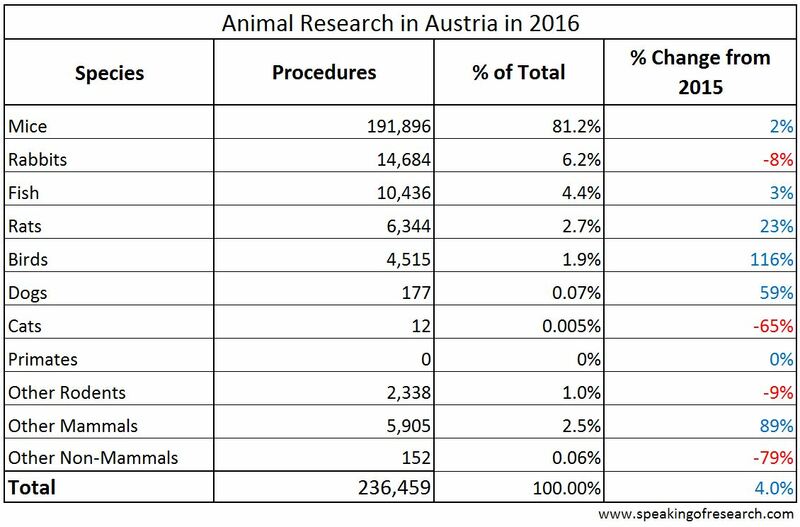 Austria reported 236,459 procedures on animals in 2016, a 4% rise on the previous year. The rise in animal experiments appears to be mainly due to large increases in the number of birds (mainly chickens) used (up 116%), other mammals (up 89%; mainly pigs) and rats (up 23%). The vast majority of research was conducted on mice (81.2%), with rabbits (6.2%) and fish (4.4%) the next most common species. 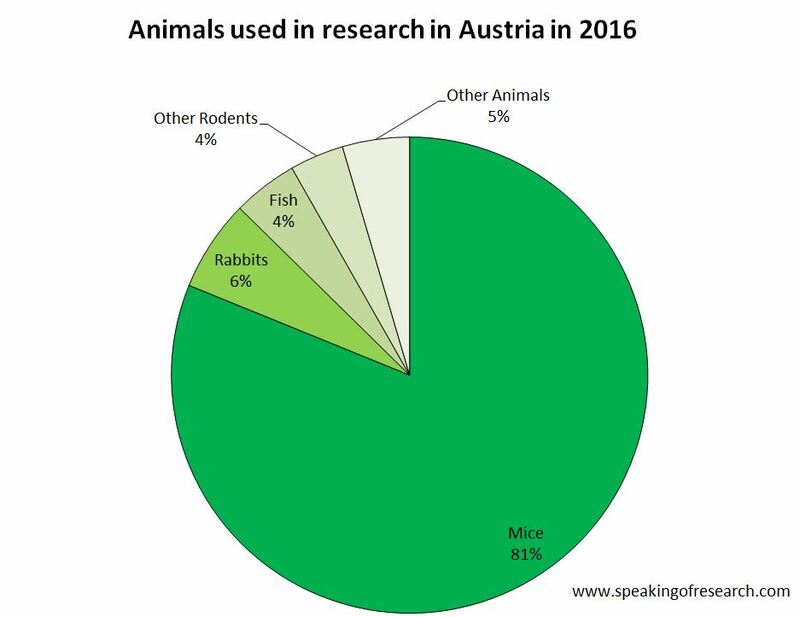 It is interesting that Austria, rabbits are the second most common species, a fact not seen anywhere else in Europe, though neighbouring Germany also has a relatively high number (4% of total). No primates were used in Austria in 2016 (or the previous two years) and dogs and cats accounted for less than 0.08% of all animals used despite the rises in the number of procedures for the former. Trend over time in animal experiments in Austria. Click to Enlarge. From historical statistics, we can see that while there has been an overall decline of almost 50% since 1990, the numbers have been edging upwards since their nadir in 1999. These numbers tend to reflect changing science funding environments within the country. This year was the third year where there were retrospective assessment and reporting of severity (i.e. reporting how much an animal actually suffered rather than how much it was predicted to suffer prior to the study). Reassuringly the proportions in each severity banding were similar to previous years, suggesting the system has been well understood. The report showed that 2.5% as non-recovery (4% in 2015) , 63% of procedures were classed as mild (60% in 2015), 27.5% as moderate (24% in 2015), and 7.3% as severe (down from 12% in 2015). Finally the statistics note that 41.4% of procedures involved genetically altered animals. These were mainly mice and zebrafish, but also included rats and other fish. 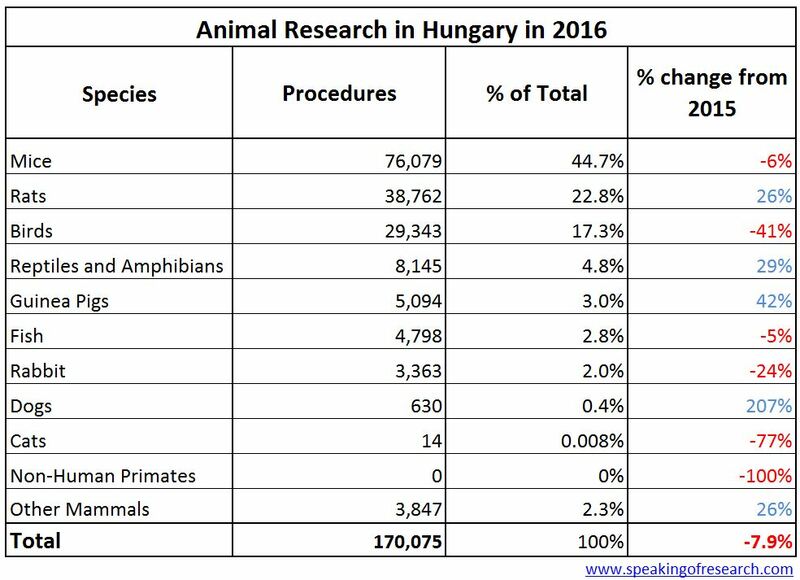 Hungary reported 170,075 procedures on animals in 2016, a 7.9% fall on the previous year. The fall in animal experiments appears to be mainly due to falls in the number of procedures on birds (down 5%), rats (down 9%), reptiles and amphibians (down 25%) and fish (down 72%). 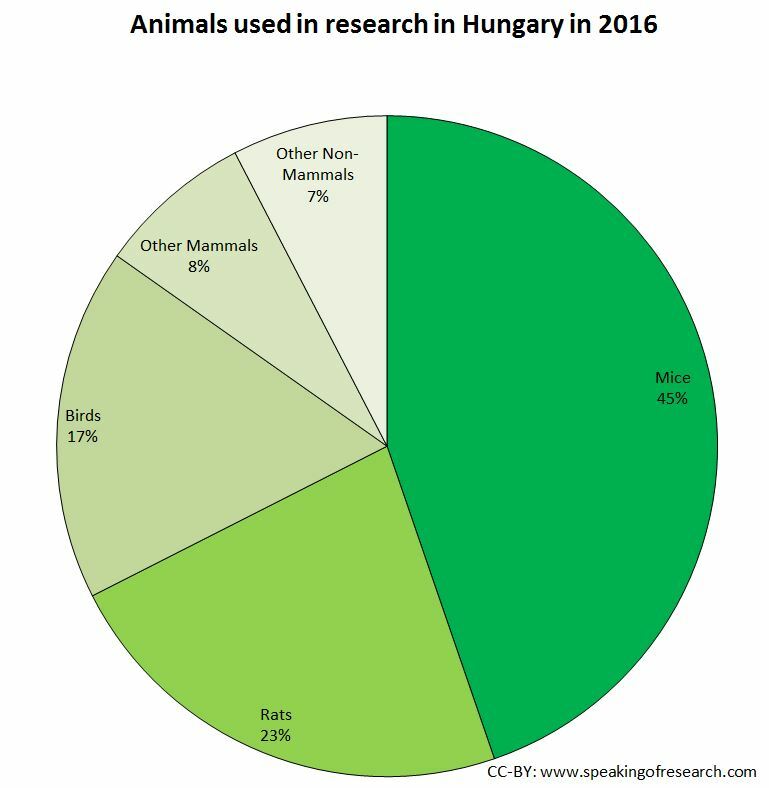 Together, mice, rats and birds account for 84% of all procedures in Hungary, this figure rises to over 95% when fish, reptiles, amphibians and guinea pigs are included. The use of primates went from 3 in 2015, down to 0 in 2016 (presumably after a specific study ended). Dogs and cats accounted for less than 0.4% of all animals used. 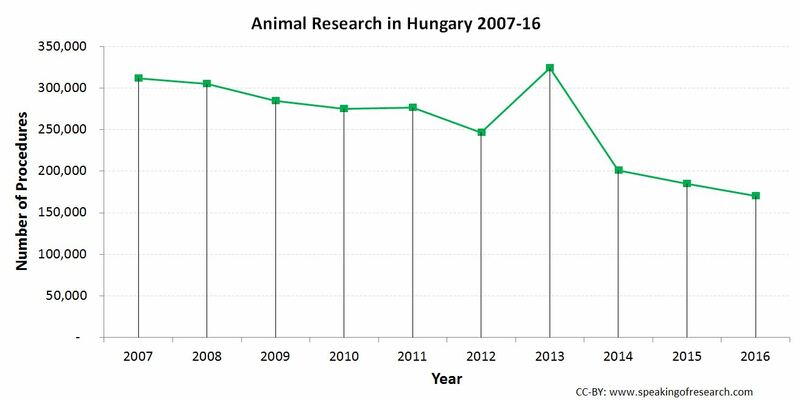 Trend over time in animal experiments in Hungary. Click to Enlarge. Using the trend graph we can see how – bar an anomalous year in 2013 – there has been a steady downward trend in animal procedures in Hungary from over 300,000 in 2007, to less than 175,000 in 2016. Perhaps coincidentally the 2013 high point coincides with the implementation of the EU Directive (and its rules around counting procedures), meaning it is possible that this figure is a statistical error caused by incorrect data from the first year under a new counting regime. This year was the third year where there were retrospective assessment and reporting of severity (i.e. reporting how much an animal actually suffered rather than how much it was predicted to suffer prior to the study). The report showed that 19% as non-recovery (8% in 2015) , 49% of procedures were classed as mild (71% in 2015), 24% as moderate (15% in 2015), and 8.2% as severe (up from 6% in 2015). Lastly, of note, only 4.7% of animal procedures were on genetically altered animal (up from 2.8% in 2015) – a much lower proportion than, say, the UK, where almost half of procedures were the breeding of a genetically altered animal. 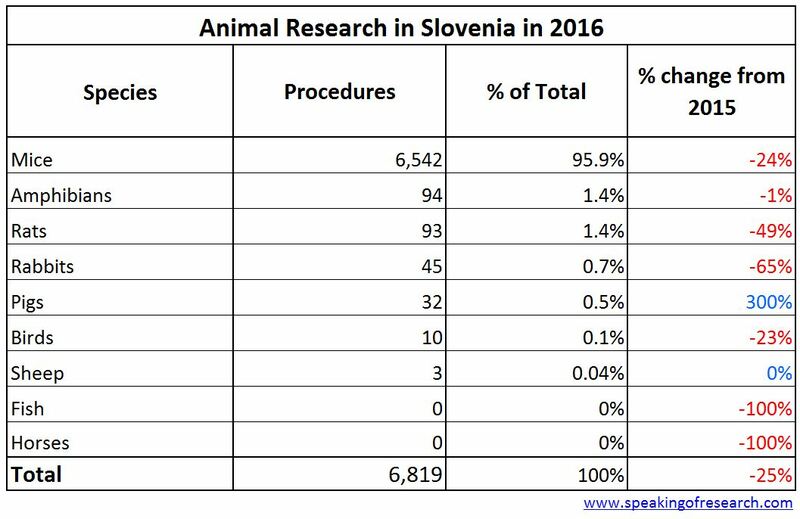 Slovenia reported 6,819 procedures on animals in 2016, a 25% fall on the previous year. The main changes was a 24% fall in the use of mice. This is particularly noteworthy given the 22% fall between 2014 and 2015. Neither fish nor horses were used in 2016 (there were 57 and 2 procedures respectively). The only rise was in pigs which went from 8 procedures to 32 in 2016. As is the case in many smaller countries (but not all), most of the research was animal testing for regulatory purposes (66%), followed by translational and applied research (26%) and basic research (6%). That’s all for today but we will endeavor to provide the latest statistics as they are published by national governments. All our statistics can be found on the Statistics Overview page. Posted on July 31, 2017 July 31, 2017 by EditorPosted in News, StatisticsTagged austria, Hungary, Slovenia, Statistics. Previous Previous post: Research Roundup: Lupus protein identified, vaccine for Type 1 diabetes, new chronic pain treatment, and more!